The Oriental Poppy, or Papavear Oriental are a colorful, and fairly easy to grow perennial plants. 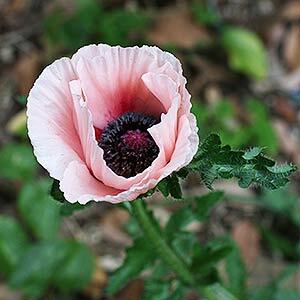 With colours ranging from white through to deep reds you can choose from varieties such as the pink flowering Papaver orientale ‘Beauty of Livermere’. The beautiful red flowering ‘Can Can’ and the attractive pink ‘Pink Princess’ along with the white flowering ‘Royal Wedding’ which has large black markings are a few available . 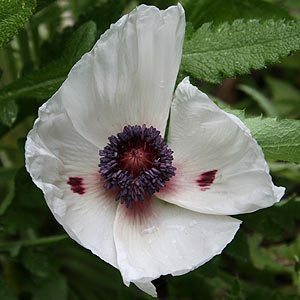 Papaver orientale ‘Drunken Choir Boy’ with its large white flowers and and deep purple spots is a wonderful plant. ‘Princess Victoria Louise’ with its soft pinks and dark maroon centre is another favourite. Oriental Poppies grow well in poorer types of soil, as long as it is well drained, although they cope with part shade, full sun is best for good flowering. Fertilize lightly with a liquid seaweed based fertilizer during early growth and top dress lightly with a little well rotted manure early in spring. Cut back after flowering for repeat blooms. In clay soils dig in some perlite or grit to improve drainage. Growing in containers is possible however you will need a deep container as these poppies do have long tap roots. We suggest adding some perlite to the potting mix to improve drainage otherwise the roots may rot. Sit the pots up of the ground to ensure good drainage. Propagation is from seed or by division or root cuttings. The fleshy root can have cutting taken from them when dormant in late winter to spring, place just under the surface of a pot filled with a gritty potting mix and keep moist (place the pot in a plastic bag to maintain humidity). New shoots should emerge and can then be potted up. The Pink flowering Papaver oriental ‘Mrs Perry, Perry’s White, ‘Royal Wedding’ and ‘Allegro’.